The Baysox had their best season in seven years, as Dave Trembley guided the team to a 73-69 record. The team still missed the playoffs, but finished above .500 for the first time since 1997. Outfielder Val Majewski earned Orioles Minor League Player of the Year honors and was voted to the Eastern League All-Star team after hitting .307 with 15 home runs and 80 RBIs before being promoted to Baltimore in mid-August. First baseman Walter Young set a single-season franchise record with 33 home runs and also led the team in RBIs (98), runs scored (88) and extra-base hits (62). Right-handed pitcher Jacobo Sequea set a new team saves mark with 27 that is now good enough for second-best in club history. Sequea also appeared in 59 games during the season, which is the third most for a single season in team history. Seven members of the Baysox played in front of the hometown fans at the 3-A-Day of Dairy Eastern League All-Star Game at Prince George's Stadium. Joining Majewski, Sequea, and Young were right-handed pitcher Dave Crouthers, outfielder Keith Reed, left-handed pitcher Scott Rice, and catcher Eli Whiteside. Crouthers picked up the win for the Southern Division. 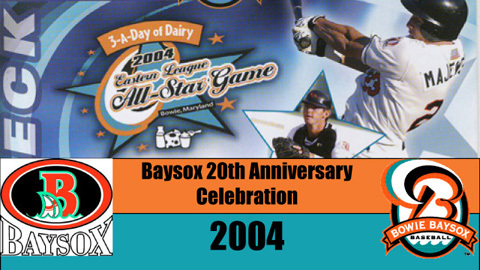 It was the second time the Baysox had hosted an All-Star Game since 2000, and the first since the Eastern League started having its own All-Star Game. Offensively, the 2004 Baysox were one of the most dangerous teams in franchise history as they finished with the third most home runs (128) and third most doubles (252).